Have you ever found yourself having the above conversation with your friends? If no, then I’m not really surprised. If you have, then you have some very interesting friends. Ask anyone in their 20s or 30s what songs automatically make them start singing along while also evoking tons of childhood memories. The answer will usually be either Disney or 90s R&B. Well thanks to Todrick Hall and Shoshana Bean, you no longer have to choose between the two! Possibly the greatest collaboration since Nutella and anything else, this is the kind of mash up that seems strange at first but absolutely incredible once you’ve tried it. I mean we’ve all slow danced to a Disney song or two at proms, weddings, etc; but now it seems like you can even dance to them at the club – I can’t believe I just said that. From pairing The Lion King with Mariah Carey to Beauty & The Beast with Boyz II Men, this mash up has it all. 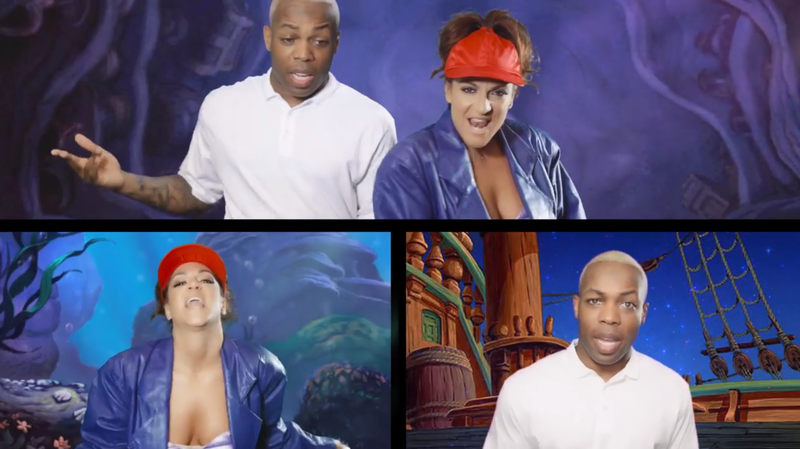 As for the talent behind this video, Todrick was an American Idol Semifinalist and – as you can see – is an incredibly talented vocalist and choreographer. Equally talented is actress, singer songwriter Shoshana Bean. So once again bravo to these two for creating a mashup that is sure to be stuck in our heads for quite a while. I absolutely love Todrick Hall’s creativity!